With miserable weather and our January blues reaching an all-time high, couture week couldn’t have come soon enough to brighten up this grey month. Haute couture is basically escapism at its finest – some of the most extravagant and beautiful works of art are sent down the catwalk, and it’s easy to lose hours ogling the shows on Instagram. The Parisian extravaganza comes to a close on Thursday, and we’ve been treated to everything from a Dior-themed circus to a Chanel bridal swimsuit. The fashion has been characteristically jaw dropping and experimental, and you can be sure the beauty looks matched. Here are some of the most eye-catching hair and make-up trends of the week. Chanel transported its guests out of snowy Paris and into the Mediterranean sunshine for this year’s show. Models walked in front of the ‘Chanel villa’, but it was actually a set inside the city’s Grand Palais. It all sounds very romantic, but the beauty looks gave the show a tougher edge. Namely, the Chanel models had sky-high hair, teased and backcombed within an inch of its life. It certainly was dramatic, but we shudder to think how much hairspray was employed. The vibe was very much ‘troll doll’, but make it fashion. 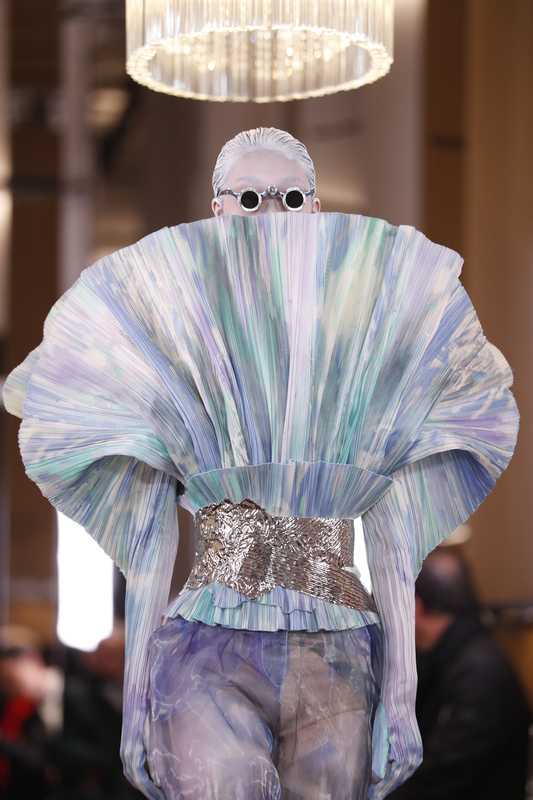 Iris van Herpen is always a highlight on the schedule, because you know you’re in for a wacky show full of 3D optical illusions. Models wore characteristically sculptural and futuristic outfits, and the hair made even more of a statement with bangs dip dyed either blue or red. The beauty look at the Valentino show was nothing short of major, with creative director Pier Paolo Piccioli enlisting the help of superstar make-up artist Pat McGrath. She meticulously glued on delicate feathers onto each model’s eyelashes in colours like navy, purple and beige. The result? Extra-fluttery lashes that were as whimsical and romantic as you can get, matching the floral and extravagant collection perfectly. Franck Sorbier might not be a household name quite like Valentino or Chanel, but he’s a giant in the world of haute couture. His show this year was held at the Musée Guimet, a museum dedicated to Asian art, and his designs matched this. 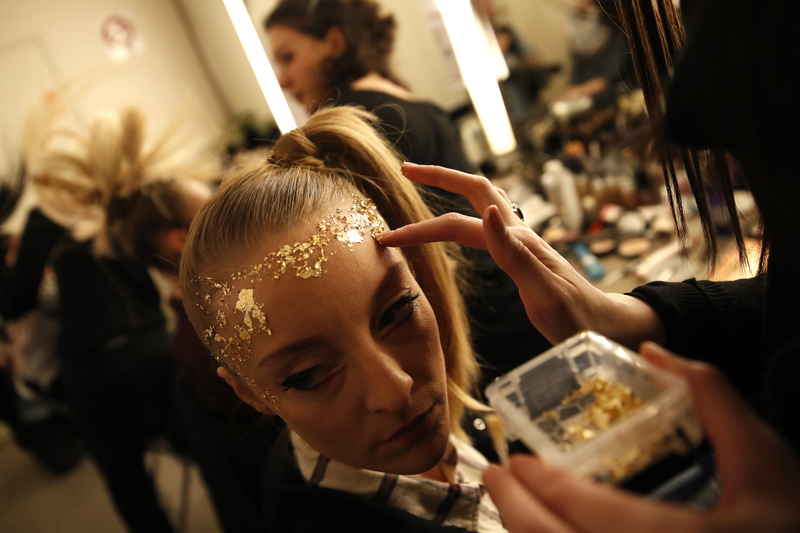 In terms of make-up, Sorbier took things to a fantastical level by dabbing gold leaf over some of the models’ foreheads. 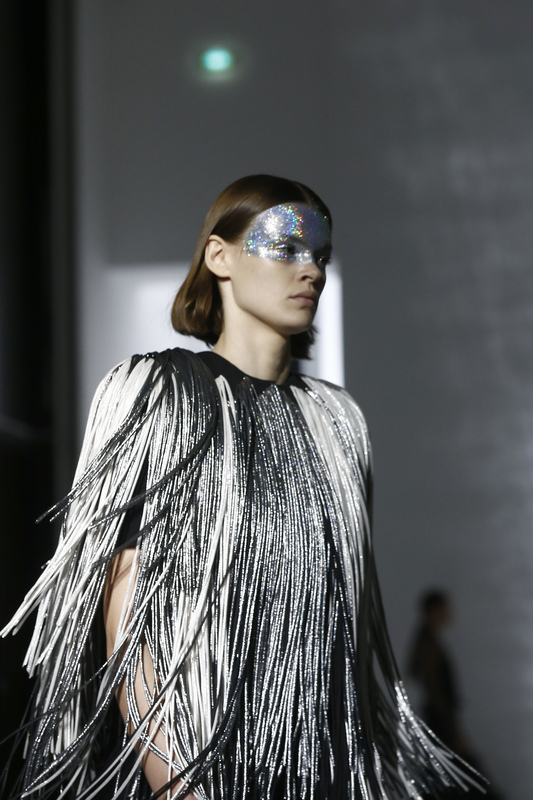 Sorbier wasn’t the only designer experimenting with glitter – the Givenchy show also called upon Pat McGrath, who covered the top half of each model’s face in a mask of sparkly silver glitter. Balmain was showing its first couture collection since 2002, so obviously just a little bit of glitter on the face wasn’t going to be enough. 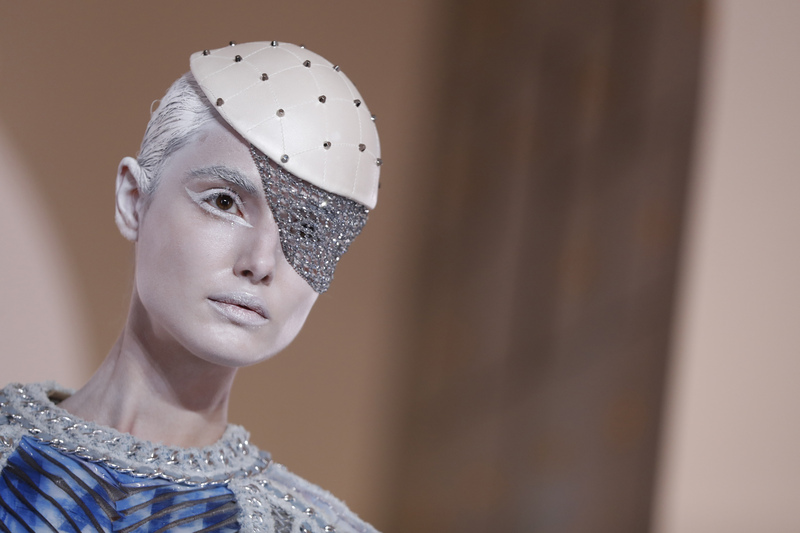 Models were transformed into aliens, and the make-up matched – think all-white faces with silvery hair and eyeliner. The accessories took things to the next level, with small glasses inspired by the opera and sparkly eyepatches – something we’re sure the chic pirate crowd will love.